The number of mentally disabled people in the Gaza Strip has increased substantially in the last years. It so happens that 70% of the cases come from the communities located near the fence that separates Gaza from the territories occupied in 1948. Such data is surprising, as most of Gaza’s population lives on the shore of the Mediterranean Sea, relatively far from the fence. The doctors and people responsible for the care of these children believe that this is due to the fact that these populations have been the most attacked in the successive massacres committed by Israel in Gaza. Massacres on which the zionist colony has used weapons of mass destruction, cluster bombs and chemical weapons in densely populated residential areas. ISM visited some of these children and their families. Three of the children of Shadi Abu Habed each suffer from some kind of mental disability, all of them are younger than five years. Shadi, whose job is blacksmith, has been unemployed for many years, as the blockade prevents the entrance of iron into Gaza. Their home was bombed by the zionist entity during the last massacre and he’s just been diagnosed with a heart condition, despite being younger than 35 years old. Ziad Habu finds himself in a similar situation. He was a taxi driver living in Beit Lahia along with his seven children until Israeli forces injured him during the 2008 massacre, preventing him from ever working again, and bombed their home during the 2014 massacre leaving them homeless. Ziad has a metal plate in his leg that keeps it completely rigid. According to the last reports of the World Bank, the blockade and the planned destruction of infrastructure in the successive massacres have raised Gaza’s unemployment to the 60%. Finally ISM met Hassan Azebda, who has eight people at his care; his mother, his wife and his six children. Hassan is a painter but, as his work depends on the entrance of construction materials, he has hardly seen any work since the blockade started. Three of his children suffer from some kind of mental disability. 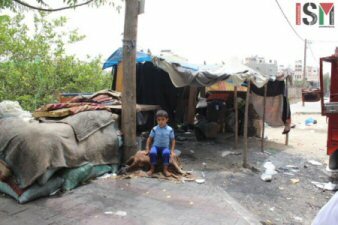 Locked in Gaza, the first obstacle these families face is that neither Israel, as occupying entity, or UNRWA, United Nations Agency responsible for the Palestinian refugees, are assuming its responsibility regarding the well being and medical care of these children, disregarding its legal obligations. These families also complain about the blockade, imposed to the Gaza Strip by Israel, Egypt and the Palestinian Authority, preventing the entry of the medication needed for their treatment. Unlike other children injured during the zionist aggressions, those children are prevented to receive medical assistance outside Gaza, as their conditions are evidence of Israel’s deliberate use of forbidden weapons, such as white phosphorous and depleted uranium, against civilian population. Additional photos and stories at ISM official.